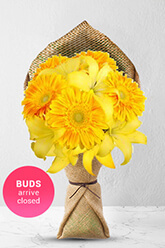 If you are wishing to send messages of friendship and positivity, this beautiful bouquet of bright yellow Gerberas and Asiatic Lilies oozes happiness and enlightenment - a sure winner!Lilies may be sent closed/partially closed in order to prevent damage and to last longerVase not included however; to add to the element of surprise, zFlowers.com recommends including a Premium Vase with your order. Gran (UK)'s flowers delivered to her grandson and great granddaughter in Perth WA as promised! Excellent service! The response from the recipient told us everything, they were thrilled. Very satisfied with the flowers and delivery, as expected. Excellent service. On time and as I ask. Everything you can ask for a flower delivery. Great same day service! Thanks! The Birthday reminder email was genius! It reminded me to order flowers for my mother-in-law's birthday, making her feel appreciated, and allowing me to easily order something nice. The ordering process was flexible enough to accommodate the updated delivery details and a beautiful bunch of flowers arrived on the day. As if that wasn't enough, you were thoughtful enough to offer a discount. Thanks for a great service. perfect for an order from France to Australia! Delivered as scheduled, left at the door as I had requested, and the flowers are apparently just as expected. No hassles. Thank you!